Over the past month, I have been busy reading five books that I normally would not have picked up on my own. This year marks twenty years of the National Book Award and this winter I joined a group of colleagues and book lovers to go back and read those award-winning YA books. There are twenty of us participating–each taking a year of winners. Each year has five novels. Each reader is tasked with choosing the one book from their year to move on to the next bracket, with the idea that we choose ONE book from the past twenty years that we all feel is the BEST of all the National Book Award Winners. I chose 1996 for a few reasons. I am at that age where YA novels were sub par when I was the target audience for YA literature. My mom would make a weekly trip to the library in the summer and come home with stacks of books from their tiny section with young people as the protagonist. I read a lot of terribly written books over those summers. The YA scene didn’t vastly improve until after I had gotten my job teaching high school English. Coming of age with shoddy writing about gender stereotypes and predictable plots made me want to revisit what judges deemed exceptional back then. I read this one in grad school for an adolescent lit class circa 2004. I remember being blown away that this sort of literature existed for young people since everything we read was extremely different than the tales of summer romances and back-stabbing best friends that I had access to. Since it had been more than a decade, I re-read the book for this project. I was sure this would be my pick for the best. Parrot in the Oven: Mi Vida is told from the point of view of 14-year-old Manny Hernandez who lives with his sisters, his brother, and his parents the barrio in California. The writing was beautiful. Martinez creates lovely vignettes for each chapter painting each scene with similes like when he describes the pepper plants he and his older brother are going to pick from to earn extra money: “…gesturing down at some limp branches leaning away from the road, as if trying to lift their roots and hustle away from the passing traffic” (10). The way he describes what the sky looks like above the pepper field, “clouds boiling like water on the horizon” not only appeal to the reader’s visual sense, but also reminds us that it is so blisteringly hot that even the clouds feel it (13). While the writing was lovely, the plot was underwhelming. Manny’s family has issues and he is deciding whether or not to join a gang. At the time of publication, the race wars in California had tensions across the entire country running high. 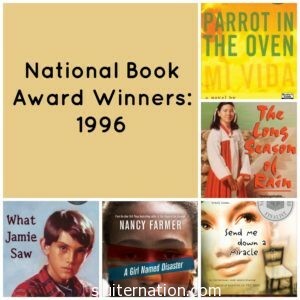 Not many authors had so eloquently written about the Latino experience from the eyes of a Latino youth, so it is not surprising that the plot coupled with poetic prose, won an award twenty-years ago. However if I were to hand this book to my middle school students now, I don’t think they would be as blown away after reading the works of authors like Benjamin Alire Saenz and Margarita Engle. After reading reviews of this one, I was looking forward to something ground-breaking. What Jamie Saw read more like what I remember 90’s YA lit reading like: potential that is just not realized. The plot is that Jamie witnesses his mom’s boyfriend do something mean to his younger sister. Mom and Jamie and the baby leave. They are afraid of the ex-boyfriend. The problem is that the plot falls short. Other than mentioning something–domestic abuse–that probably wasn’t mentioned much then, it really stops there with just mentioning it. Since Jamie is just a little kid, the language is simplistic and we are left to infer what conversations his mother is having when she asks him to play outside or tend to his baby sister. In the end, the book felt like an after school special, but with even less drama. Definitely did not seem award-winning to me. This may have been my least favorite of all five books. At least with What Jamie Saw I was interested in the plot even if it did turn out to be too simple for my taste. Send Me Down a Miracle had better writing, but the plot was pretty terrible, as was the characterization. Charity is supposedly a 14-year old who lives with her younger sister, her dad, who is the preacher in a super small Southern town. Her mom is gone to a birdcage convention and later we find out she may or may not be coming back. A stranger–an artist from New York–comes to town one day to work on her art. She announces she will be living closed from society for a month. When she comes out she claims to have seen Jesus sitting on a chair in her house. First of all, Charity seems way younger and naive than any 14-year old I have ever met. In fact, she is somewhat unbelievable as a 14-year old. Her father reminds me of the dad in Footloose, but less of a fully developed character. The most interesting characters to me where Adrienne (the artist) and Charity’s mom, both of whom are flat and undeveloped. In the beginning I thought Adrienne was going to be the star of the book when Charity describes her entrance: “Then in walked Adrienne into our tidy home, looking like some wild jungle woman with fat, frizzed-out hair, rings on her toes, and this long, brightly colored skirt that was practically see-through.” But no. The entire plot of the town going crazy for a “Jesus Chair” was just poorly executed, in my opinion. This was the last book I had to read and it was hard to find. When it showed up to my house I took one look at the book cover and groaned. I thought for sure I would be bored to tears. I was pleasantly surprised. The Long Season of Rain takes place in South Korea in the 1960’s. It starts during the rainy season, Changma, while school is out for recess. The story is told from 11-year-old Junehee’s point of view. She is the second of four daughters and lives with her parents and her paternal grandmother. One day her grandmother brings home a boy her age who was orphaned in a mudslide. His presence brings out family secrets and tensions between her mother and father. I will admit that historical fiction is one of my favorite genres, and I hadn’t read any historical YA lit about Korea before, so even though I thought the book would bore me, I was wrong. The writing was lovely and wove Korean words easily with English in a way that was not confusing to the reader, but brought a richer sense of tradition and culture. Kim also does a good job of weaving the traditions of a conservative Korean family into the plot. They do not stand out, but rather enhance the story and push the motives of the characters. I would classify this as a fairly typical bildungsroman because Junehee “comes of age” as she loses her innocence of her parents’ relationship and family workings. This was my runner-up pick. As you may have already guessed, A Girl Named Disaster is my pick for the best of the 1996 National Book Award Winners. Like The Long Season of Rain, it falls under the historical YA fiction heading. At first, I wasn’t so sure about it since I have recently read two other YA books set in Africa, but this one blows both of those away too. Nhamo is 11-years old living in a traditional village in Mozambique where she doesn’t fit in. Her mother was killed by a leopard when she was a baby, and her father took off before she was born. Culture places daughters with their father’s family, but Nhamo is brought up by her maternal side. After sickness plagues her village, it is decided that she should be married off to a terrible man to bring health and luck back to the village. Nhamo decides it’s time to find her father’s family who are supposedly in Zimbabwe. Her year-long adventure is like a cross between the hero’s journey and a bildungsroman. She definitely “comes of age” during her travels, but it almost exactly follows the typical “hero’s journey” elements as well. Of all the books this is the one that not only stuck with me after I was done reading, but I found myself thinking about it when I wasn’t reading it. It was a book I stayed up late to finish because I needed to know what would happen. That alone makes it the clear front-runner. The writing was beautifully descriptive as well. One of the qualities of a truly good book–especially world literature–is when the author can make the cultures and traditions come alive and make sense and weave them into the plot of the book. Farmer does that impeccably in A Girl Named Disaster. I look forward to reading the winners from the 2012, 2008, 2004, and 2000 groups so we can decide on one to push through to the final brackets! I’ll keep you posted!